English Actor Paddy Considine starred in one of my favorite movies of 2002 called "In America" about an Irish family's move to New York City. 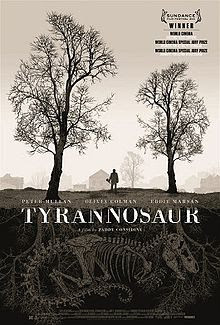 Now ten years later Considine has gotten behind the camera to direct his first feature called "Tyrannosaur" It's a brutally emotional punch to the gut, that will have you thinking about it for days. 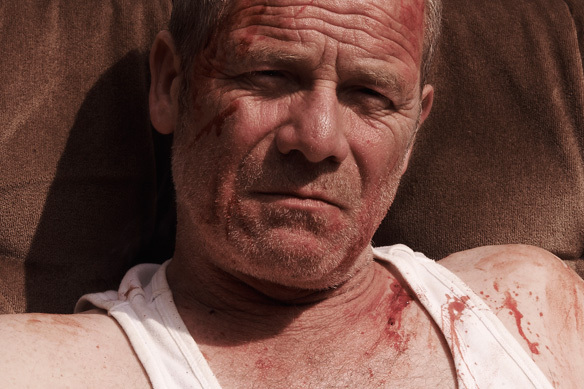 Peter Mullen plays Joseph an angry, rage-filled older man who in the first scene, after being tossed out of a bar, kicks his dog a little too hard and kills it. Joseph is extremely lonesome after the death of his wife (and now his dog) he spews his anger and hates to everyone he comes in contact with. Every little annoyance seems to send him into a rage. He is however friendly with the neighbor boy who lives with his mother and thug-ish boyfriend. Joseph is unemployed and after mouthing off to the welfare office and smashing their front window he has a sort of panic attack. He seeks refuge in a Christian charity shop. This is were we meet Hannah played by Olivia Colman. Hannah is warm, caring, and offers to pray with him. Joseph just gives her the usual mouthful of insults. Hannah lives in a very nice part of town in a big house with her husband James. We find out that all is not right in her seemingly perfect and easy life. James is fiercely controlling and an angry drunk. While Joseph uses his words to hurt people, James uses his fists. Joseph starts to hang around Hannah's shop and little by little they start to form this weirdly intense relationship. It's not a sexual one, but they really connect in a real deep down primal way. They are both extremely damaged people, who are reaching out for someone to bond with. When James stops by the shop and sees his wife help Joseph try on a suit, he becomes enraged. Unlike Joseph, though he never shows this side to anybody but Hannah and it's no different here. He promises that he will get her when she gets home. The things James does to his own wife are quite disturbing and Hannah does something that is equally unforgivable in the eyes of the law. Joseph is a very complex man and although his introduction is quite jarring and violent we begin to see that he really is an honorable man deep down, but he puts up such a hard front that its hard for anybody to see it. The ending of the film really makes you question what is right and what is wrong. It's not really a happy ending or is it?